Preheat oven to 180oc. Butter a large casserole dish. Heat stock.. Place cabbage in a large bowl. Fry the onion in the butter. Once onion fried stir into cabbage. Boil pasta yet don't over cook. Drain pasta when cooked and stir into cabbage. Add herbs to this mixture and stir, then place into casserole dish. Whisk together the cream and cheese then add to stock, mix well. Season to taste. Pour mixture over the pasta/cabbage. Cover with foil or lid then bake for 30 minutes. Remove lid/foil for the last 5 minutes of cooking time. 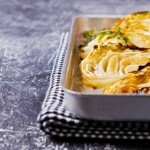 creamy cabbage and gruyere bake 4 out of 5 based on 2 ratings.